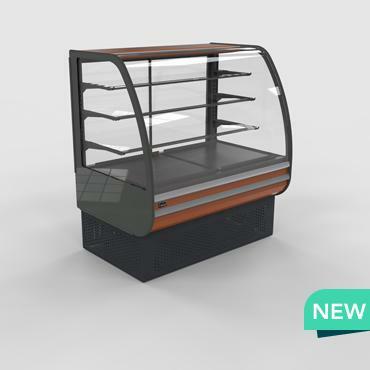 FREOR has expanded its serve-over counters family by adding a new display counter – ELISA S. The new serve-over counter offers excellent presentation for confectionery products. It features smooth rounded glass structure, panoramic endwalls, 3-level glass shelves with 4 levels of LED lighting, providing an appealing look of your products. Its functional design with bottom display deck as a drawer system makes it convenient for product placement. Rear sliding insulated glass doors ensure energy efficiency. ELISA S is the latest model in our line of serve-overs and is a great choice for appetizing display of deserts at any store.